Anthony Siragusa was born May 14, 1967 in Kenilworth. Quick, agile and big for his age, he was a good football and baseball player as a kid. He played the defensive line and handled kicking duties for the Brearly High Bears, eventually growing to a height of 6’3” and tipping the scales at close to 250 pounds.. He was also the star of the wrestling team, losing just once in 98 matches and winning a state championship in 1985. Tony’s brothers, Pete and Elio, were also skilled grapplers. Tony accepted a scholarship to the University of Pittsburgh and played defensive tackle for the Pitt varsity four years beginning in 1986. He was plagued my knee problems throughout his career. He actually had the ACL removed from his left leg. That was a huge red flag for NFL teams and in 1990 Tony went undrafted. A handful of teams expressed an interest in Tony as a free agent, including the Eagles. He was tempted to play for Buddy Ryan, but feared he would never get off the bench with so many stars ahead of him on the depth charts. Instead, he signed with the Colts. A doctor in Indianapolis predicted his knee would last for two NFL seasons, maybe three. 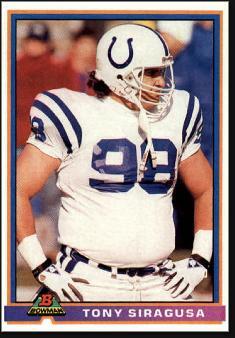 He played seven for the Colts, at nose tackle and defensive tackle. In 1995, the team made it all the way to the AFC title game. Tony grew unhappy with the coaching staff and management in Indianapolis. He signed a free agent deal with the Baltimore Ravens in 1997. He was a key member of the defense that helped the Ravens win the AFC Championship in 2000 and beat the Giants in Super Bowl XXXV. He retired after the 2001 season. During his 12-year career, Tony’s weight ballooned to 340 pounds. Despite his balky knees, he maintained his quickness and tenacity. Tony was also a big personality, popular with fans and the press. He transitioned easily to a career as an actor and TV personality, and was a sideline reporter for FOX NFL broadcasts. In 2012, Tony published his memoir, Goose on the Loose. 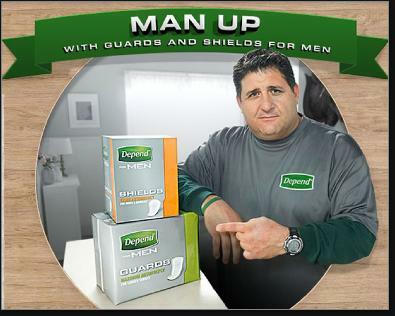 In 2013, he became a spokesman for Depend for Men.